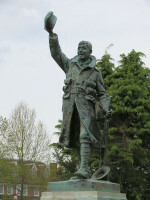 War Memorial, Radnor Gardens, by Mortimer Brown . 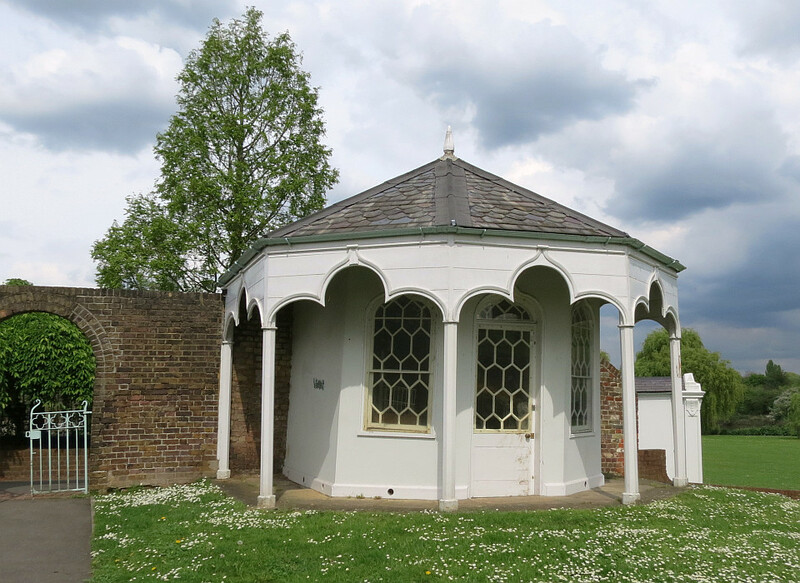 Radnor Gardens, a little way out from the centre of Twickenham, contains a war memorial of some sculptural significance, as being the principal public work by the sculptor Mortimer Brown. The monument consists of a bronze figure of a soldier on a Portland Stone plinth, with three panels of low relief sculpture and a coat of arms, also in bronze. The summit figure is shown marching forward, waving his hat in one hand, rifle in the other, clearly returning home victorious. There is a sense of movement in the figure, his coat swirling open, and some success at conveying an idea of jauntiness in his stride. He is shown smiling, always difficult in sculpture, and perhaps having lost something with the years and the patina the bronze has acquired. The treatment is sketchy in the detail, a characteristic of many statues from the 1920s, when this piece was made, and onwards. Panels showing Sailors, Airmen, Women at War . 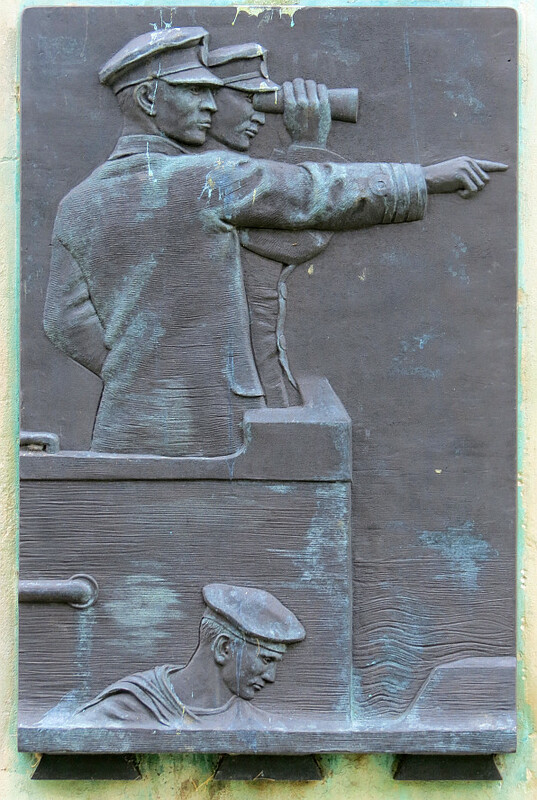 One of the panels shows two sailors on the bridge of their ship, we presume, one pointing forward, the other looking through his binoculars. In the foreground we see the head and shoulders of a further sailor. 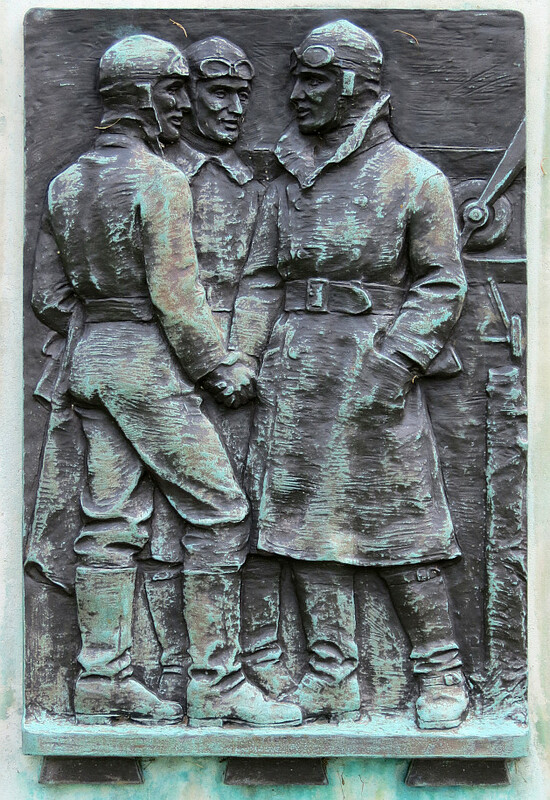 The second panel shows three airmen, two shaking hands, with the propeller of an aircraft seen behind. 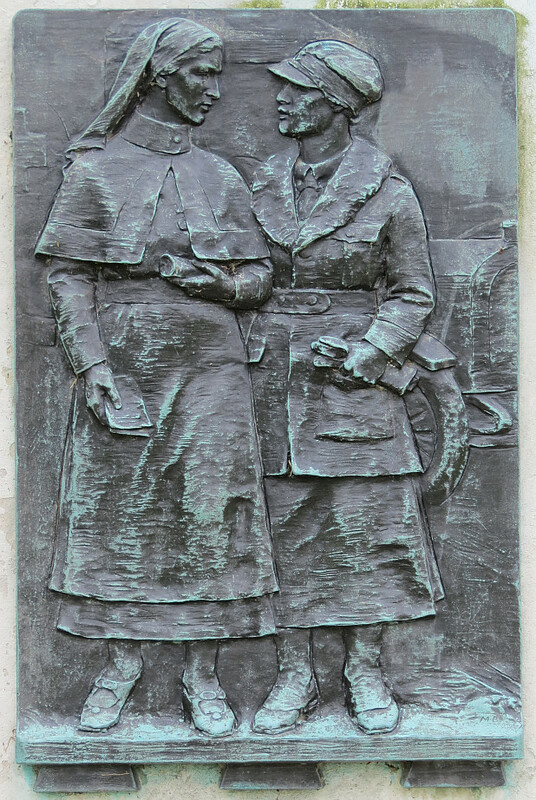 The third panel shows two women, one of whom is clearly a nurse, and a motor car behind. Each of the panels has a scene which is economical and centred on the figures with the minimum of background to convey the situation. Decent work, well sized for the viewer at a little distance without a confusion of detail. The coat of arms on the front, which must be that of the regiment commemorated, features a small swan at the top. 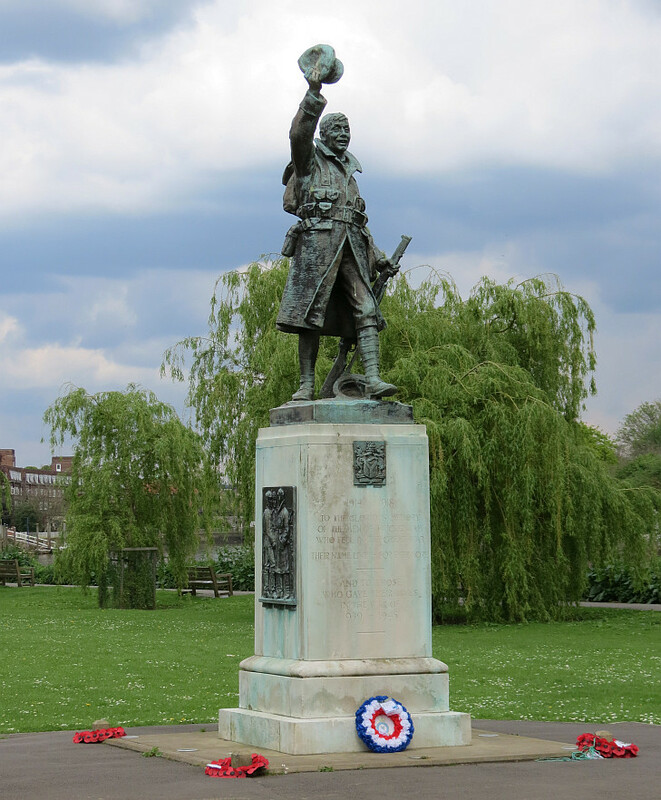 The commemorative text is to both the soldiers of Twickenham in the First World War, and, added later, to the Second World War. 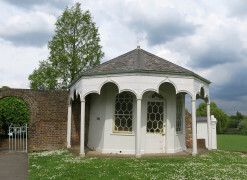 A signpost in Radnor Gardens notes that the Fourth Earl of Radnor, after whom the Gardens were named, had Horace Walpole and Alexander Pope as his neighbours; a gazebo and summer house in the Gardens date from this period, pleasant little buildings but without sculptural interest. A wall remains in the Gardens from Radnor House, or at least, as an inscribed stone indicates, belonging to it. A second stone notes the level to which ‘A Remarkable High Flood’ rose on 12th of March 1774. The sculptor, Mortimer Brown, is a not very well known figure who seems to have been most active in the 1900s and 1910s, and this work is not only his one public sculpture that I know of, but one of his last significant works. He lived to a ripe age, dying in his early 90s in 1966.